Source: CICH graphic created using data adapted from Bayrampour, H., & Heaman, M. (2011). Comparison of demographic and obstetric characteristics of Canadian primiparous women of advanced maternal age and younger age. Journal of Obstetrics and Gynaecology Canada, 33, 820-829. Older women (having their first baby at 35+) are more likely to have a chronic health problem such as hypertension and diabetes before their pregnancy (22%) compared with 13% of 20 to 29 year old women. Women over 35 are also more likely to have a cesarean birth – compared to women aged 20 to 29 (41% vs. 26%). 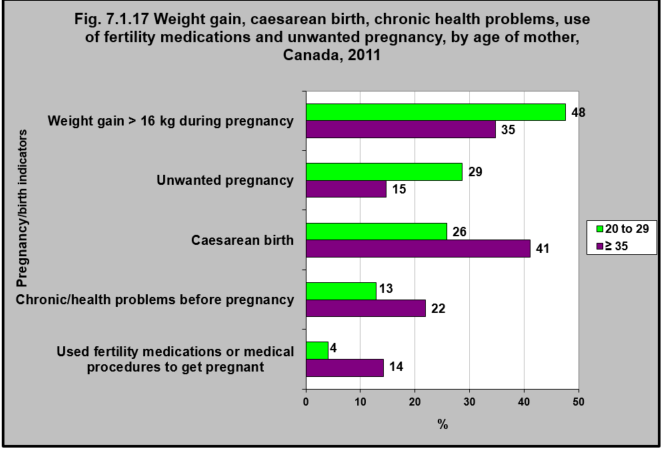 Younger women are more likely to report that their pregnancy was unwanted (29%) compared to older women (15%). Women aged 20 to 29 years are more likely to gain more than 16 kg during their pregnancy (48%) compared to older women (35%). 1Statistics Canada, Canadian Vital Statistics, Birth Database, Table 102-4503 Live births, by age of mother, Canada, provinces and territories, annual. http://www5.statcan.gc.ca/cansim/a26?lang=eng&retrLang=eng&id=1024503&&pattern=&stByVal=1&p1=1&p2=38&tabMode=dataTable&csid=– accessed March 15, 2017.